The Bombardier CL.601-3R Challenger is a twin-engine executive jet aircraft for 2 crew members and up to 19 passengers. Development of the CL-600 Challenger family started in 1974, when Bill Lear designed the LearStar 600, a 12-place business jet. Canadair bought the manufacturing rights in 1976, and renamed the design Canadair CL-600 Challenger. The first prototype of the airplane flew on 8 November 1978. The second and third prototypes flew in March and July 1979. On 3 April 1980, a test flight with the first prototype above the Mojave Desert ended in a disaster, with the airplane crashing due to a deep stall. In August 1980, certification was granted with temporary restrictions. Deliveries of the Canadair CL-600, powered by two Lycoming ALF-502L turbofans started in 1981. The design was developed further and on 10 April 1982 the Challenger 601, a refined version with more powerful General Electric CF-34 engines and winglets, made its maiden flight. In 1983, the CL-601 replaced the CL-600 in production. In 1986, Bombardier Aerospace bought Canadair. The Bombardier Challenger became a family of business jets. A number of models entered production including in 1989 the CL-601-3R, an extended range version with an extra fuel tank added to the aircraft's tail. 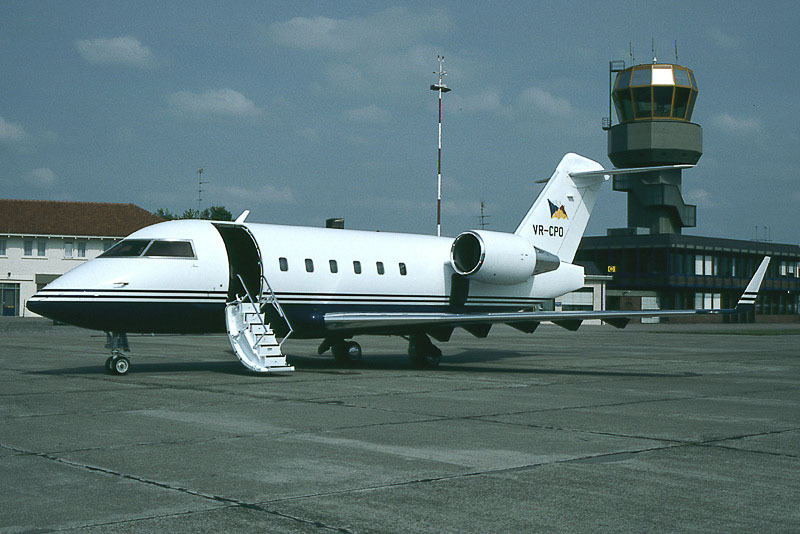 The 1994-built Bombardier Challenger 601-3R was testflown as C-GLXO and on 3 November 1994 registered C-FTOH as a Bombardier CL-600-2B16 with Bombardier Inc., Montreal. Registration C-FTOH was cancelled on 17 April 1995 and the executive jet was registered VR-CPO at the Cayman Islands with P&O Containers Ltd. as owner and P&O Aviation as operator. On 16 May 1995, just a few weeks after the VR-CPO entered service with P&O, the Challenger visited Groningen Airport Eelde in the Netherlands. On 14 May 1997, the aircraft was re-registered VP-CPO, as before owned by P&O Containers Ltd. In 2000, registration VP-CPO was cancelled and on 11 August 2000, the aircraft was registered N165SC as a Bombardier CL-600-2B16 with Signature Combs Aircraft Sales in the USA. The N165SC was registered with SPX Investments on 25 October 2000 and with Bombardier Capital Corporation on 3 July 2002. The Challenger was registered N723HA with Hawker 723 Holdings Inc., Wilmington, on 31 July 2003. The aircraft was re-registered into N723HH on 9 October 2003. The next registered owner was Wells Fargo Bank Northwest NA Trustee on 8 January 2008. Registration N723HH was cancelled on 25 March 2008 as exported to Mexico, where it entered service as XA-PTR.